As we get ready for our new orchard there are a few casualties of our new planting – all the attractive, but ultimately unproductive, shrubs at are in the way. They’ve got to go and so far I haven’t found any takers – if you want one just let us know on the contact page and you can come down and dig one up to take away. Now is the perfect time to transplant shrubs, so what are you waiting for! 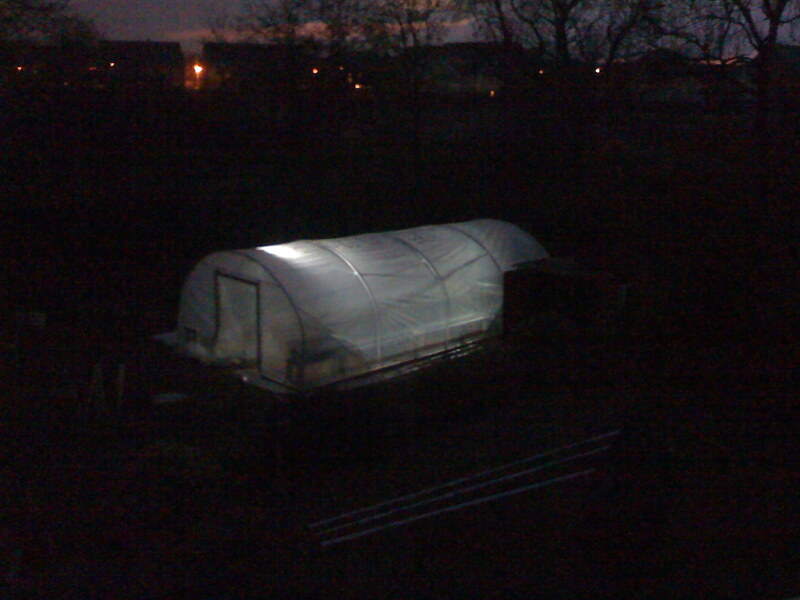 With the nights closing in we really need good lighting in the poytunnel so that we can keep working on the aquaponic system in the evenings. After a fair bit of research I found the perfect solution – low-energy security lighting. We’ve now got two of these lighting the tunnel, they’re only 36w each but give the same amount of light as standard 150w security lamps, we bought them online from TLC for £17.99 each. We’ve made some major progress on the Aquaponics in the last couple of weeks, and now I’m getting ready to start ‘cycling’ the system. This is what you need to do to build up the colonies of beneficial bacteria in the growbeds that will clean the water once we have added the fish. 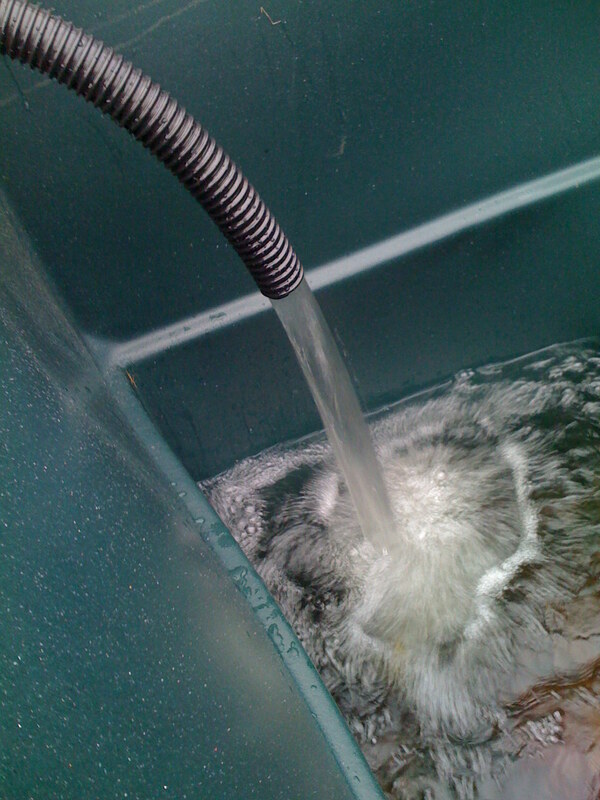 To minimise the risk to the fish you do this cycling ‘fishless’, by adding ammonia manually to the water. Once the bacteria are going well they will feed off this ammonia, turning it into nitrates for the plants. Without the bacteria, ammonia in the fish water would quickly reach a fatal level, so we need to have the bacteria well established before we add any fish. Now you can see the plumbing all connected it hopefully makes more sense: The water overflows from the fish tank at the back into the dark grey pipes which feed each growbed. 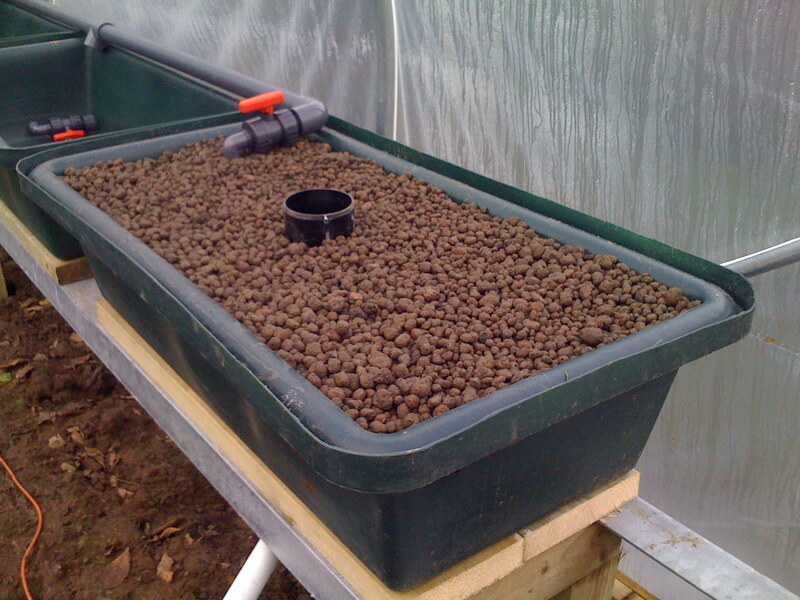 The water then slowly drains through holes in the bottom of the growbeds into the white return pipe, which returns it to the sump. So now I just have to get the bacteria to build up and we’ll be ready for the fish – I might even start to plant some seeds in the beds while we’re waiting. Apart from two light fittings, all of the bulbs in our house are traditional incandescents. And there are lots of them. Tackling them all at once would be a mammoth task, so we’re going at it in a piecemeal fashion. Now that the evenings are drawing in we’re using the lights in the house a lot more, and I think they’re starting to become a significant drain on our electricity consumption. My first spot to start was the bathroom. This has three – yes three – recessed light fittings. That makes it sound palatial, but it’s not. What it is is unbearably bright. Each fitting takes a full-size “R80” 100 watt reflector bulb. Luckily these had been progressively blowing, so at point of replacement we only had one running, and the light in the room was adequate, although poorly spread. After some detailed online research I gave up and went to B&Q. Quite a lot of money later I had three Megaman 11W R63 reflector bulbs – each one equivalent to a 60W conventional bulb. I went for the slightly smaller, lower-powered R63 size because I new that three 100W-equivalent bulbs would be far too bright. 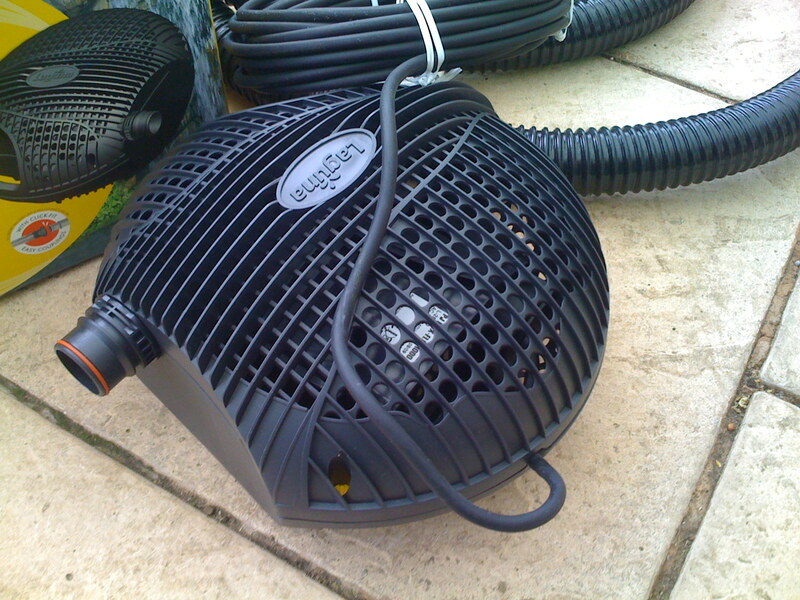 Putting them in was easy; the bulbs fitted perfectly and didn’t protrude from the ceiling. Turning them on was a little less impressive. Startup is a little slow, with them remaining dim for a little too long for my liking. Once they are all going though they are impressively bright – in fact if they’d had more of a choice I might have been tempted to go for something closer to 8W (40W equivalent). Still, even with these three, we’ve reduced the wattage in the bathroom from 300W to 33W – that should help our electricity bills a little, be a good step towards our 10:10 target, and make us a little more solar-ready. As my work laptop is currently a smoking wreck on the bench of our local IT support guys, I’ve had a bit more time to work on the Aquaponics system. And so here we are: the first growbed is ready. All the piping to it is cut, the standpipe and standpipe surround are in, and I’ve filled it with gravel. I have to admit, that is a pretty good feeling – even though I now have another 11 small ones like this, and then 3 large ones to do. Pretty fantastic stuff really! Not long and we’ll be planting, and adding fish. 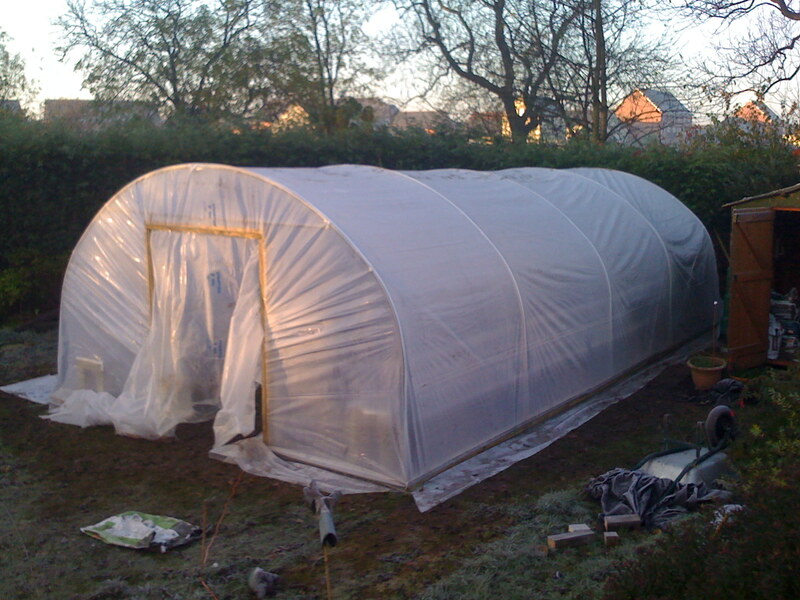 Finally, after much work inside and outside the polytunnel over the last few weeks, we have put the polythene onto the tunnel. We only just got there – had a full-on Sunday getting everything ready and then doing it. We haven’t finished yet – one end needs more battens, and we need to put the doors back on. We did manage to do it though, and just in time – the first frost of the season was last night, and while everything outside the polytunnel was frosty, everything inside was just a few degrees warmer, with no frost. Not bad bearing in mind we only got the cover on at dusk, so it didn’t have much time to heat up yesterday. Today we’ve started to put the completed growbed stands in. 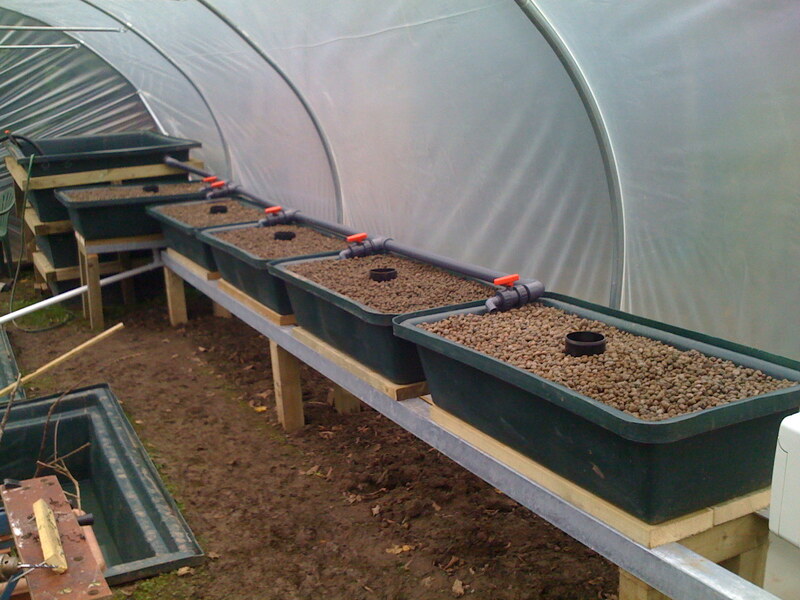 The growbeds now all have drain holes in their bases and the drains are almost all in place. We’ve even connected all the sumps together (nice big 110 mm pipe). Now I just need to get the tubing and fittings for the drains and inlets and we’ll be ready to start the system up. This morning we awoke to the first frost of the season, which probably means it’s our first frost for about six years. I just thought it was worth recording the date so we can use it to plan next year’s planting and harvesting. For the record, the forecast was 2°C !